Roberto Coin never does anything in a small way. Just four short years after he conceived his brand in 1996, he was acclaimed as number seven on the list of best-known jewelry brands in the United States. And if that doesn’t leave you breathless, a mere two years after that he ranked third on the international scene and first in Italy. Some might say it is his bold-yet-relatable designs. Others might say it’s the quality of his products and his well-developed business acumen. The reality? It’s all of the above and so much more, with each new collection further revealing the brand and the man we’ve come to know and love. The new Pois Moi collection has an ultra-modern edge with a touch of vintage — perfect for women of any age. It offers a unique combination of style cues, all within the context of high-polished white, yellow and rose gold — the newest look for this season. 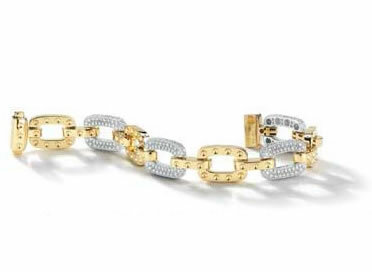 “After the huge success of the Appassionata collection, I was looking for something with an innovative design that could become a signature style as Appassionata did,” says Roberto Coin. Appassionata’s basket-weave architecture took the jewelry world by storm, and it was no doubt a hard act to follow. But it appears Coin succeeded. Each piece in Pois Moi is a fresh example of the designer’s courageous insight. In particular, the characteristic “soft square” silhouette finds its inspiration in an Italian vintage trend: the “television shape” reminiscent of the old TV monitors from the 1950s. In May 2013, at the Andrea Palladio International Jewelry Awards in Vicenza, Italy, Roberto Coin was presented with an international award for the Best Jewelry Brand in Corporate Social Responsibility. The brand was honored for its constant commitment to promoting the values of sustainability, responsibility and ethics in the international jewelry community.